A very symbolic photo in souvenir of Uriel di Barbochos de Reiau de Prouvenco, his mom: Poppenspaler's Sangria and......Georgy holding them. This was taken in 2008. Lots more Barbets today have that look of Vieux Barbet...and that differentiates them from any other water dog and Poodles. I found out this morning that an SCC judge called Pierre Nau passed on. He was one of the few "older" judges who knew what a Barbet was. 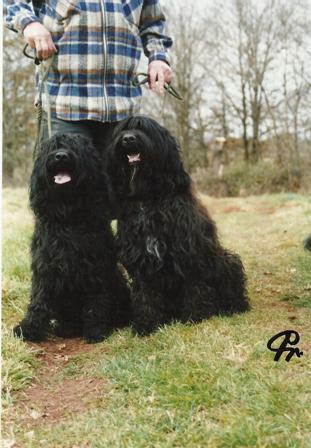 He worked very closely with Philippe Seguéla ( Barbet.Free.fr) and they started a club: les Amis du Barbet, at the time Jean Claude Hermans had decided to re-incarnate the Barbet by crossing poodles, and saying he was the father of the modern Barbet. Pierre Nau confirmed my Coccolina a couple of weeks before the standard modification in 2006.A judge had refused to confirm her in January. I had driven round trip the 2 200 kms to his house in Tarbes. I can't even imagine what would have happened if Coccolina had not been able to reproduce. It's a sad day for the Barbet because there are less and less judges who have a clue what a Barbet is and the newcomers are not a gift to the breed. That's 2 for this year. He had stopped judging about 3 years ago and I sent him Xmas cards just to say hi. A sad day for the breed. With him you didn't have to have sterile discussions about how a poodle coat could form strands when it was long. He could tell you that it was not possible. It was nice to be able to converse with people who could teach you something. Can someone tell me how this dog below's coat can form strands? Not in a million years.It becomes one big un-groomable mat of tangles, like the webs some weave.Then you have to shave it. What is the difference between the 2 dogs? None. The tail can be cropped on both.It is at 12:10.It will never have a crochet at the end.Neither of these 2 coats will ever form strands, which is an essential characteristic of the Barbet who has a long coat. Docteur Vétérinaire Philippe Mimouni, member of the Commission Scientifique( and the person who officially reads all of our French results) de la Société Centrale Canine has empowered me to ask all of you Barbet owners or breeders across the world to furnish him with a certain amount of information about the hipscore results of your Barbets. The reason being his writing an article for the next SCC review, calledCYNOPHILIE FRANCAISE. 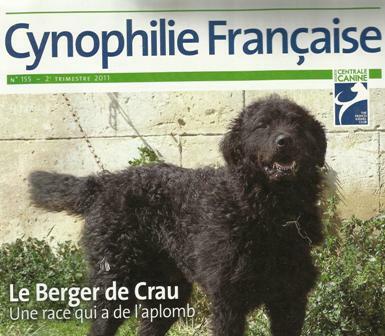 Send all information as soon as possible to the Vice President of the Club du Barbet, Lagotto et autres chiens d’eau, Dr Jean Louis Geissant. Your contribution is greatly appreciated. I expressed my thanks to him from all of us already for taken the breed into consideration and told him that he could count on the worlwide cooperation of all of you. Novaforesta Denzil, Odo for friends and Barbeciarskiej Chaty Alma, aka Nelly are announcing their first litter of Barbet pups due around January 11th, 2012. This will be the first litter born in the UK and "exportable" since the laws have changed! Hurray! My 6...so as tyou can see, they would not fit in the back of a convertible sportster, would they? !